The devolved administration in the north of Ireland is moving towards collapse as both of the main unionist parties have said they are ready to withdraw from the power-sharing coalition with nationalists. The Ulster Unionist Party (UUP) is to formally pull out of the Stormont Executive later today. There are clear threats of a similar action being taken by the much larger Democratic Unionist Party (DUP), which could bring down the Stormont administration within weeks. Although it is more than seventeen years since the Good Friday peace agreement, and ten years since the Provisional IRA announced it had decommissioned its weapons and stood down its Volunteers, unionists still hold the Adams/McGuinness leadership of Sinn Fein responsible for any suggestions of lingering PIRA activity. The current row goes back to the shooting dead of ex-PIRA member Kevin McGuigan on 13 August. McGuigan was one a number of suspects in the murder by criminals of Gerard Jock Davison, a former senior IRA figure, in May. Although the PSNI police blamed a small vigilante group, Action Against Drugs, for the McGuigan killing, it said it was investigating the possible involvement of individual members of the Provisional IRA. Last weekend, in an unusually political statement, PSNI police chief George Hamilton praise the new peaceful stance of Sinn Fein and the Provisional IRA. “Our assessment indicates that a primary focus of the Provisional IRA is now promoting a peaceful, political, republican agenda,” he said. He also accepted the “bona fides” of the Sinn Fein leadership regarding their rejection of violence and pursuit of the peace process. However, there was a strong reaction to the claim that the PIRA exists in any form. British Direct Ruler Theresa Villiers said that it “didn’t come as a surprise to me”. “My understanding is, very much in line with that of the chief constable, that a number of the organisational structures of the Provisional IRA still exist but that there is no evidence it’s involved in terrorism or paramilitary activity,” she said. She added that she was satisfied for the moment that all parties in the Stormont Executive were supportive of the “principles of democracy and consent”. But she warned she “wouldn’t shy away from dealing with the consequences and taking action” if that was found to change. The Sinn Fein leader Gerry Adams has insisted that the IRA is “gone” and had been “undefeated” when it disarmed and stood down in 2005. He criticised those who have “opportunistically and cynically” sought to use the recent killings of Jock Davison and Kevin McGuigan to attack Sinn Fein. 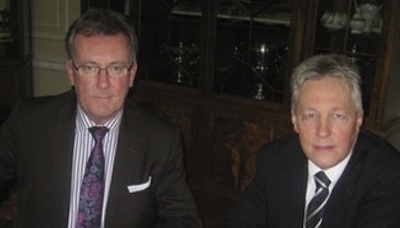 First minister and DUP leader Peter Robinson (pictured, right) and Sinn Fein’s Martin McGuinness are both still on holiday, but are expected to return over the coming days. Former Taoiseach Bertie Ahern said yesterday it was a “time for cool heads”. He backed the claim by ex-justice minister Michael McDowell that the Dublin and London believed allowing an IRA “husk” to continue to exist would prevent breakaway groups from filling the vacuum. It was claimed that, following the 1998 peace deal, some Provisional IRA units were tacitly allowed to continue with illegal activities such as cross-border smuggling. It has also been pointed out by commentators that loyalist paramilitary groups have never even pretended to dismantle their structures, and have continued to recruit and appoint new ‘brigadiers’ and leaders through a cycle of infighting over the years. The murder of ‘dissident’ Bobby Moffett in 2010 by the UVF was an example of ‘internal housekeeping’. And both the UDA and UVF continue to carry out violent attacks on a daily basis, such as a petrol bomb attack in the early hours of Wednesday morning on a loyalist critic of the UVF and his 10-year-old autistic daughter. “All of the ambiguities need to be cleared up because it’s that which has done the damage and created the ongoing problems,” he said. Sinn Fein’s Gerry Kelly accused unionists of engaging in a “sham fight” driven by electoral rivalry. He said the decision by the UUP to pull out of the Executive “reeks of opportunism and rank hypocrisy”. “The fact they have done this on the cusp of an election shows their actions are being driven by inter-unionist rivalry and electoral self-interest,” he said. Under the Good Friday Agreement, a collapse of the executive would require both the London and Dublin governments to effectively take charge until new elections are held. Such a move might allow British PM David Cameron to force through controversial welfare cuts which had been previously blocked by nationalists at Stormont. Many politicians might also hope a third serious crisis, a scandal over illegal payments allegedly made to senior politicians in relation to a multi-billion-pound property deal, can now also be sidelined. British Direct Ruler Theresa Villiers travels to Dublin on Tuesday to meet 26 County Minister for Foreign Affairs Charlie Flanagan and Minister for Justice Frances Fitzgerald. One approach could be to initiate a new round of wide-ranging talks to address all of the issues threatening Stormont. So far the SDLP and Alliance have appeared reluctant to back the unionist parties and force Sinn Fein out of government, although SDLP leader Alasdair McDonnell claimed some communities were still “held in a Mafia-like grip” by the “rump” of the Provisionals.